Credit : Upriser The observable universe that we live in has 93 billion light years in diameter worth of galaxies and wonders for us to observe with our telescopes. At the moment 46.5 billion light years in every direction of Earth is the farthest our telescopes can reach. To put this into perspective, the light from a galaxy 46.5 billion light years will never reach us if emitted today. The Universe age is 13.8 billion years but the expansion of the universe means we can see 46.5 billion light years away. So what is beyond the 46.5 billion light years that we can see? Most likely more Universe. Let's go further beyond that. Is there an edge of the Universe? If so, what is over that edge? Back in the 50s, physicists began to question if our universe was the only one. If our Universe was able to pop into existence at the point of the Big Bang, could other Universes have formed too? Back in 2010, Wilkinson Microwave Anisotropy Probe (WMAP) data and claimed to find evidence of another universe. A cold spot on the Cosmic Microwave Backround brought a hypothesis that an entire Universe might have crashed into ours! This hypothesis was dismissed quite quickly. In Quantum Mechanics the Multiverse is described in the Many Worlds Interpretation. Think of a di, if you roll it and it lands on a certain number, that leaves 6 entire simultaneous universe chances per each number! There are supporters and skeptics of this theory. It does sound quite far fetched at face value however, if this is one Universe then what is outside of it? 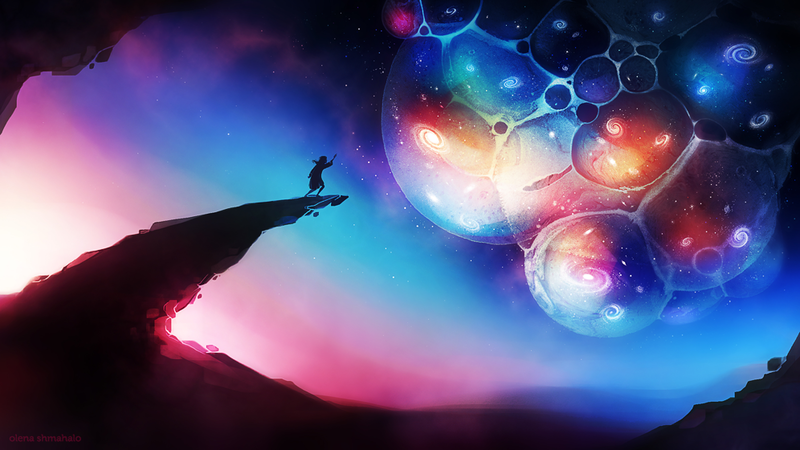 The laws of Quantum Mechanics allow for other Universes, only we will most likely never see them. In another Universe, they may even be able to contact us! In an infinite Multiverse, a Universe which can contact other Universes can't be discounted. If spacetime goes on forever, at a certain point it must repeat itself. This opens the possibilities that somewhere in another infinite universe, you will be in the exact same spot, reading this exact same blog at the exact same time you are now!